Let’s ride Alaska style! Hop on an ATV Side-by-Side machine and strap in for this exciting backcountry adventure. Your adventure begins with safety training. Next, your guide will fit you with a helmet, safety glasses and gloves and you are on your way to wilderness Alaska! 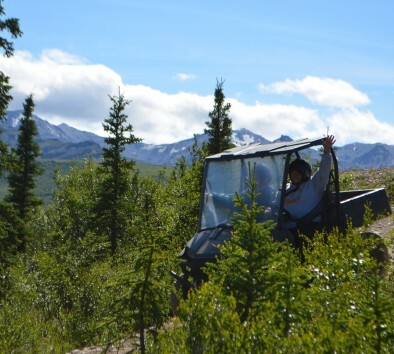 Your guides will lead you along the Alaska Range, through valleys and streams, up foothills and on tundra that offers breathtaking mountain scenery. Make sure to bring your camera to capture multiple scenic viewpoints and stops—you will be sure to get the perfect spot to snap a unique photo! Your trek takes you high up on Black Diamond Peak where you can view the entire Healy Valley and spills you out into the Dry Creek river bed. Seek out animals and action on this exciting tour geared to the more experienced ATV adventurer. A full service family style meal is included. Price is per person, not per unit. Minimum age to drive is 16 years. A waiver must be signed. Bring your driver’s license. Ride will be bumpy. Pregnant women or guests with back or neck problems are not allowed to participate. Waiver must be signed and medical conditions disclosed. Activity level: Moderate.